These paintings were left to you, so how is a gift to the people of Ireland being sold? An Taisce has been granted leave to take a judicial review of the granting of the export licences of the Beit paintings. EFFORTS TO HALT the sale of the paintings from the Beit Collection at Russborough House is gearing up with members of the art community due to meet tomorrow to discuss how to stop the Christie’s auction. 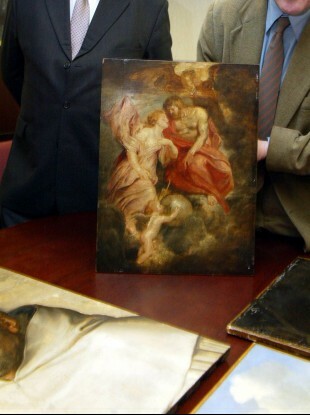 An Taisce has already called on the Arts Minister, Heather Humphreys, to step in and investigate the sale of the collection which includes significant paintings by Rubens, as well as two Francesco Guardi works. In the High Court today, An Taisce was granted leave to take a judicial review of the granting of the export licences of the Beit paintings. An Taisce’s case is that export licences were granted for these paintings by the National Gallery of Ireland, rather than the Minister of Arts, Heritage and the Gaeltacht, who is charged with granting licences for the export of paintings under the Documents and Paintings (Regulation of Export) Act 1945. Despite repeated correspondence between all parties, An Taisce claims it has not received any indication that the powers to grant export licences have lawfully been delegated to the National Gallery of Ireland. It is seeking a decision that the export licences issued by the National Gallery are not lawful and should be quashed. The review is expected to be heard on 3 July. Yesterday, Taoiseach Enda Kenny said Minister Humphreys will meet with the Chairperson of the Beit Foundation today to discuss “possible opportunities”. He told RTÉ that it was too early to say if the government would be willing to purchase the paintings but noted that they were left to the Irish people. In all, nine paintings will be auctioned at Christie’s in London. The efforts to stop the auction will not save two of the paintings by the 19th century English artist John Atkinson Grimshaw which are going under the hammer today. The rest of the paintings are being put up on 9 July and are expected to sell for millions. How can they be up for sale? Speaking to TheJournal.ie, Charles Stanley-Smith from An Taisce said the paintings were gifted to the Alfred Beit Foundation – a trust with an objective to maintain the Russborough House and the paintings. It’s up to the trust to do what it thinks is the best to maintain, in good order, the wishes of the Beits. Several paintings from the Beit Collection at Russborough House are to be sold in London. Source: Gareth Chaney/Photocall Ireland! In 1976, Sir Alfred and Lady Clementine Beit created the Alfred Beit Foundation to preserve Russborough and its art collection “for the future enjoyment of the Irish people”, according to the house’s website. They decided to bequeath seventeen of the most important paintings from their collection to the National Gallery of Ireland (NGI), while about 30 or 40 paintings remained at Russborough. The Alfred Beit Foundation owns and operates Russborough House and Demesne in County Wicklow. In 1978, it opened Russborough to the public for guided tours. In a BBC radio interview with Sir Alfred Beit and Lady Beit from 1985, featured in an article by Rosita Boland in this weekend’s Irish Times, reveals their wishes to have the collection remain “intact” in Russborough House. An Taisce said the gift is one of the greatest art bequests to any country in modern times. The proposed sale on the paintings will “destroy the integrity of the historic Beit collection and is exposing Ireland to reputational damage internationally in the protection and management of cultural heritage”. The sale of the paintings has already made international headlines. The national trust group also questions the sale of other paintings from the collection in private sales this year and is calling for the sale to be abandoned. Stanley-Smith said there were questions surrounding the private sale of a painting by French artist Jacques de Lajoue earlier this year. The painting had hung in Russborough House until last year, before it was sold privately and not through a public auction. Stanley-Smith said the meeting of like-minded people this week, which includes those from UCD School of Art History & Cultural Policy, the Irish Georgian Society, and An Taisce aims to come up with a way to save the paintings, which he said is not too late to do. “There needs to be a combination of government help, public fundraising and perhaps some international fundraising, to help keep all of this here, in Ireland. While he said An Taisce understands that it is difficult to maintain a house of Russborough’s size, there needs to be an alternative to raising funds, other than putting paintings from the collection up for sale. He said government bodies need to get together to find a solution, adding that the National Gallery of Ireland and the Heritage Council have not had budgets to make purchases for the last few years. Last week, the National Gallery said that it would be interested in some paintings from the collection, but that it cannot step in and purchase the paintings as they have not been given an acquisitions budget since 2010. Judith Woodworth, chair of The Alfred Beit Foundation said the sale of the works is needed to set up an endowment fund to safeguard the future of the house. She said it’s “committed to safeguarding the long term future of Russborough”. However she said the sale of the paintings to ensure the upkeep of the stately home is an “absolute necessity”. Email “These paintings were left to you, so how is a gift to the people of Ireland being sold?”. Feedback on “These paintings were left to you, so how is a gift to the people of Ireland being sold?”.